The house in Wagga is the second home we’ve owned. Both with this purchase and with the house in Edmonton, we opted for a build over an older home for the main reason that we like to know that it is ready to move in to and that the roof or heater or something won’t need replaced immediately. Or that we won’t have to redo the kitchen before we move in. Sometimes, there are trade-offs. In both cities, there are some amazing older homes with a lot of character in absolutely fantastic locations. But those either require sinking a lot of money into them to buy already renovated, or a huge cash outlay after purchase to make it what we want. So both times, we have headed to the suburbs for a worry-free, ready to go house. Well, sort of; in Edmonton, we bought a lot and had a builder put a house on it. That took a long time and was, in a way, the ultimate renovation. 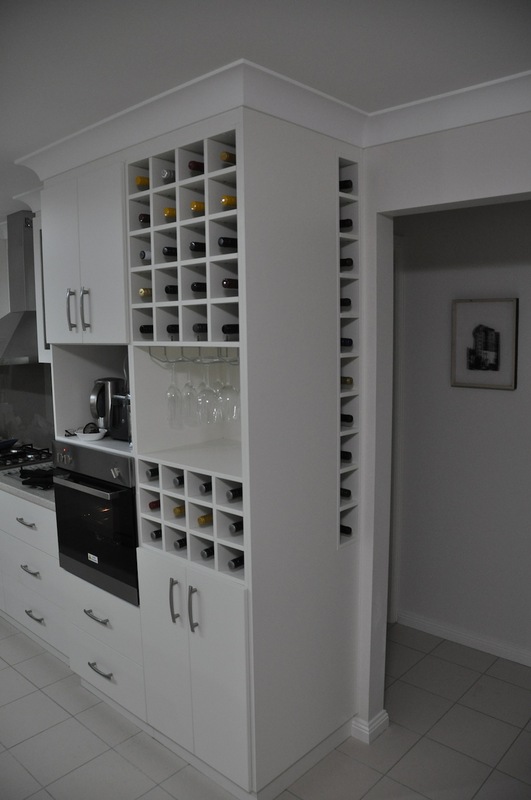 Here in Wagga, we renovated on a much smaller scale – even though it is a brand new house, we have had a joiner (cabinet maker in Canadian terms), plaster, plumber, etc. in making two pre-occupancy alterations. One of them was something that needed fixed, the other is a value-added upgrade of our own doing. We were pretty sure our washer/dryer stack wasn’t going to fit into this space. When looking at the house before we bought it, we noticed that the space in the laundry room where the washing machine goes wasn’t very big. We measured it and found that the space was about 5 mm to narrow. Lisa really likes this washer, and we both really like the house, so it wasn’t a deal breaker. We figured that we could get it fixed easily. So just after getting possession, we went to Harrisons Joinery, the company who had done the laundry, kitchen and bathrooms, to ask about this. They were a bit baffled that they hadn’t left enough space, and wondered if we have an extra large washing machine…they always leave about 60 cm. “No,” we said, “our washing machine is the average 59 cm wide, but the space is only about 56.” So they said they would come look at it. 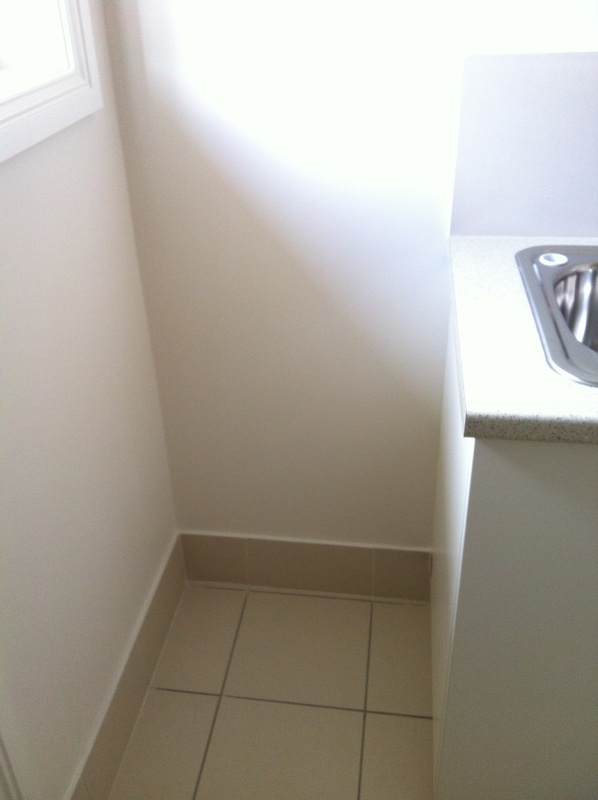 We don’t know why the builder left this space, but we managed to fill it. As an incentive to get them there, we also dangled another job in front of them. 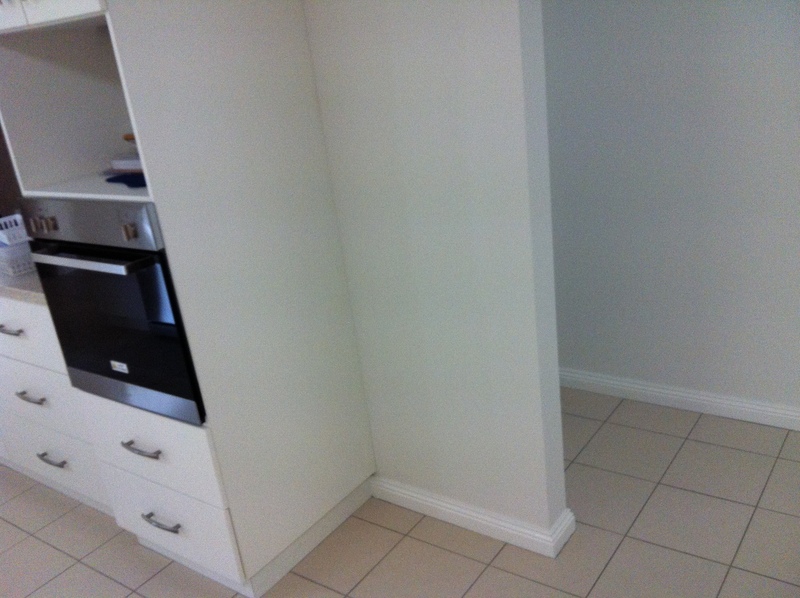 For some reason, the builder designed the kitchen with bit of wasted space along one wall. The kitchen is open plan, with an island and then a lot of drawers and the cooktop, wall oven, etc., along the wall. That wall unit, however, ended about 30 inches from the door to the extra bedrooms. It was just a wasted space really, and our original intent was to buy a cabinet, some corner-oriented thing or maybe a wine rack, to go there. However, quite quickly Dan’s amazing brain went to work and he came up with the idea to get the Harrison’s people to build an extension. Brilliant! The photos here show just how much of a genius Dan is – and Harrisons and the other tradies they brought in did such a great job that you can’t even tell it wasn’t part of the original plan. Proof that Dan is a genius. His idea for this corner is far better than what the original designer had…which was nothing. At our initial meeting at Harrisons, and later when Dan met them at the house to do the measuring, all that was ever mentioned in terms of price was for the wine rack. And then when they sent us a formal contract to sign, it was just for that part of the work – nothing for the laundry renovation. When it was all done, we paid, we got a final receipt, Dan went to pick up the key we had left them, still no mention of a charge for this renovation. Sweet! Maybe they were going to bill the builder for the screw-up. But it wasn’t really a ‘screw-up’ as they were just doing what they were asked, and had no obligation to alter it. Maybe they just built the cost of the laundry reno into the kitchen work, though we think what they charged us for that was reasonable anyway, and it adds value and character to the house. 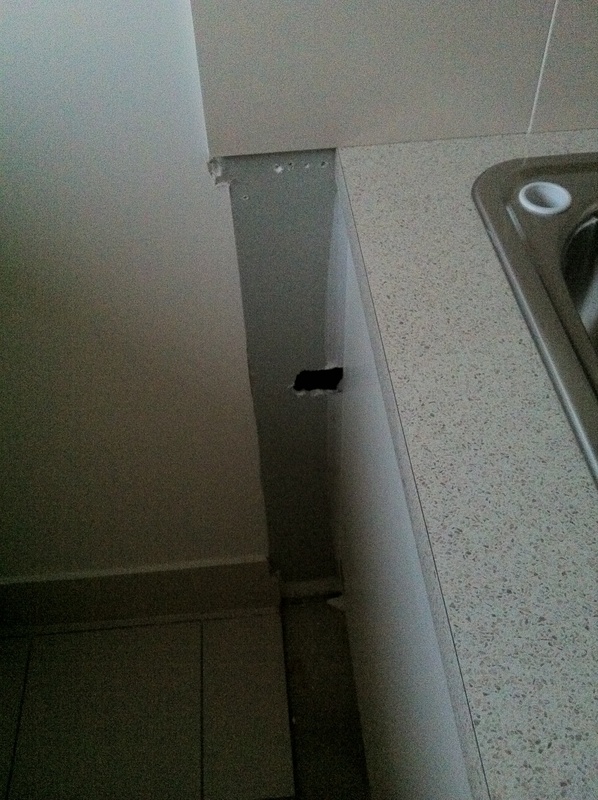 Cutting the bench (what Aussies call countertops) and moving the sink this much caused havoc with the plumbing. There was another bit of fall-out from the laundry reno however; when we put in the washing machine, the discharge hose wasn’t long enough to hook into the drain. When Harrisons altered the cabinet, they moved the sink and the new configuration required a longer hose. So Dan goes to Bunnings (we should own stock in it by now!) and buys a new hose, but it doesn’t have the correct ends. He tries to fit it on anyway, and when Lisa does the first load of laundry we end up with a wet floor. Not really bad, but…well, bad enough. Dan is a genius, but not too handy. Lisa then had a novel idea of calling a professional to actually fix it properly. Dan consents… She tries one company, leaves a message, doesn’t get called back so tries another. The guy calls her, makes an appointment for later in the day. He comes, but has brought ‘in’ hose, not drain…looks at the fittings, says he can make something up will be back the next afternoon to fit it on. Comes back next day, installs drain hose and a longer inlet hose (the other one was so short their was no way to move washer if something fell behind it), and he and Dan wiggle the washer/dryer stack back into place. Then he realizes he doesn’t know how much to charge – he hadn’t checked ‘at his shop’ what the cost of the hoses was. Says he will call tomorrow with a price (and then, in the Australian way, he would just give us has BSB number and we deposit direct into his account). Two weeks later, we haven’t heard from him. So we planned on buying a house that didn’t need renovating, and though this one needed one small renovation, that was free and we the part we did pay for has been a great addition. This entry was posted in house, kitchen, laundry, real estate, renovations. Bookmark the permalink. I saw the first picture and thought, that’d be a great place for a wine rack. Then I saw the second picture. Great minds.